Between 2005 and 2015, the U.S. added 150,000 net new businesses. But in an economy that is moving from industrial to digital, 2,100 counties lost a total of 200,000 businesses over this time period, while just over 1,000 counties gained 350,000 businesses. There are many ways to measure opportunity in America, but one of them is whether businesses are growing or shrinking. Donald Trump dominated in Opportunity-Falling America. If the 2016 election were held only in the 2,109 counties that lost businesses, Trump would have won by 3.5 million votes, 53.0-47.0%, and by an Electoral College landslide of 343-195. Hillary Clinton dominated in Opportunity-Rising America. If the race were held only in the 1,029 counties that gained businesses, Clinton would have won by a commanding 6.4 million votes, 54.6-45.4%, and by a solid Electoral College margin of 286-252. This electoral opportunity gap appears to be new. 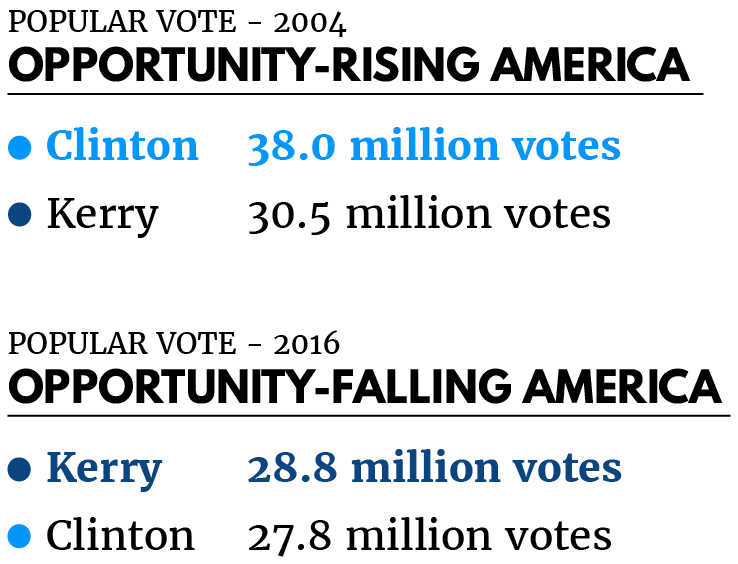 The spread between voter outcomes in Opportunity-Falling and Opportunity-Rising America jumped from 2.2-points in the 2004 Bush-Kerry race to 15.2-points in the Trump-Clinton race. Clinton actually underperformed John Kerry by more than 1.3 million votes in Opportunity-Falling America (even though Kerry lost the national popular vote by 2.9 million votes and Clinton won hers by 2.9 million). African-American turnout was 1.5-points lower in the 25 counties that lost the most businesses compared to the 25 counties that gained the most. More study needs to be done about whether lagging economic performance led to lagging electoral performance among core Democratic constituencies. The dawn of the digital economy has affected people and places in many different ways. One of the more profound and underreported ways is that it has concentrated opportunity in America. We decided to look at one specific measure of opportunity, the growth or the decline in the number of private sector businesses up and running in a region. Between 2005 and 2015, America added close to 150,000 net new businesses according to the Census Bureau. This would indicate a modestly growing economy and at least the semblance of ample opportunity for people to find jobs and compete for wages. But the creation and destruction of businesses was not evenly disbursed throughout the country. There are 2,109 counties in America where the number of businesses in operation actually declined between 2005 and 2015. In these counties, the number of businesses up and running fell by nearly 200,000, or 5.9%. In the aggregate, these counties had more than 1.2 million fewer private-sector jobs in 2015 than in 2005. In another 1,029 counties, the number of businesses in operation increased over those same ten years. In these counties, 350,000 net new businesses were added, an increase of 8.5%. In the aggregate, these counties added nearly 6.7 million private sector jobs from 2005 to 2015. Another way to look at it is this: In two-thirds of America’s counties there were nearly 200,000 fewer places to even apply for a job compared to 2005. In one-third of the counties, there were nearly 350,000 more places to seek a job. The concentration of opportunity appears to be a recent phenomenon in the United States. 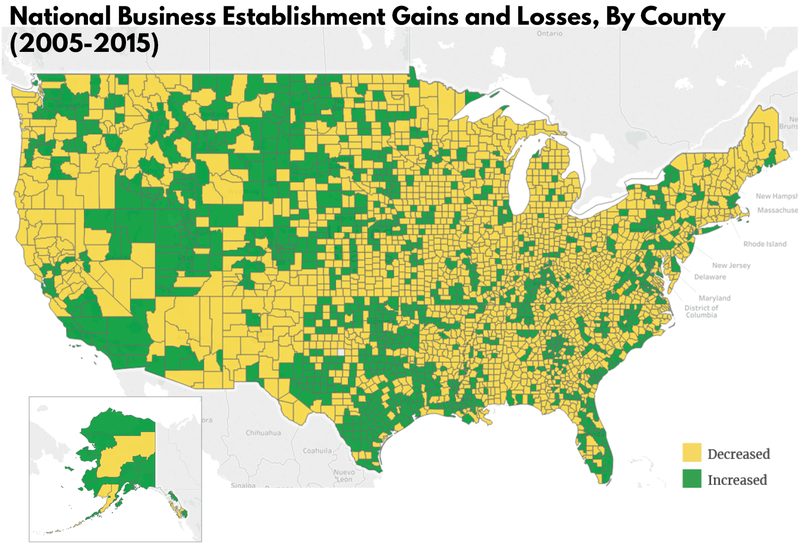 In the previous ten years, from 1995 to 2005, only 964 counties lost businesses. These 964 counties lost just under 44,000 businesses, or a 4.5% decline. Nearly 2,200 counties gained more than 900,000 businesses over the same time period. With roughly 1,000 counties adding new businesses at a steady clip and roughly 2,100 losing them, we wanted to see if there were political consequences and patterns that emerged from this concentration of opportunity. To do this, we created two different “countries”: one home to the roughly 60 million voters who live in the counties that lost businesses; the other inhabited by the nearly 70 million voters in the counties that gained businesses or broke even. Would the outcome of the presidential election be the same or different? And how has that changed from 2004, the year prior to when we started measuring business losses and gains? The electoral gap between the opportunity-rising and opportunity-falling parts of America widened substantially between 2004 and 2016, from just over 2-points to just over 15-points. The concentration of opportunity seems to be having a sizeable impact on the ballot. The findings were eye-opening. Voters in opportunity-falling parts of the country flocked to Trump. Voters living in opportunity-rising places flocked to Clinton. The electoral gap between these two parts of America widened substantially between 2004 and 2016, from just over 2-points to just over 15-points. The concentration of opportunity seems to be having a sizeable impact on the ballot. And it may be that the antidote to right-wing populism is the important but difficult task of bringing opportunity to more people and more places in America. When we divided America into two separate countries – one where businesses declined between 2005 and 2015 and one where businesses increased—we dubbed the country where businesses declined as “Opportunity-Falling America.” Opportunity-Falling America is comprised of 2,109 counties that shed 197,752 private-sector businesses between 2005 and 2015, a decline in business establishments of 5.9%. While the population grew by 2,630,614 from 2010 to 2016, the number of people employed in private sector jobs in those counties fell by 1,212,540 from 2005 to 2015. Average private sector wages in nominal dollars increased by 27.8%, from $35,377 to $45,205. 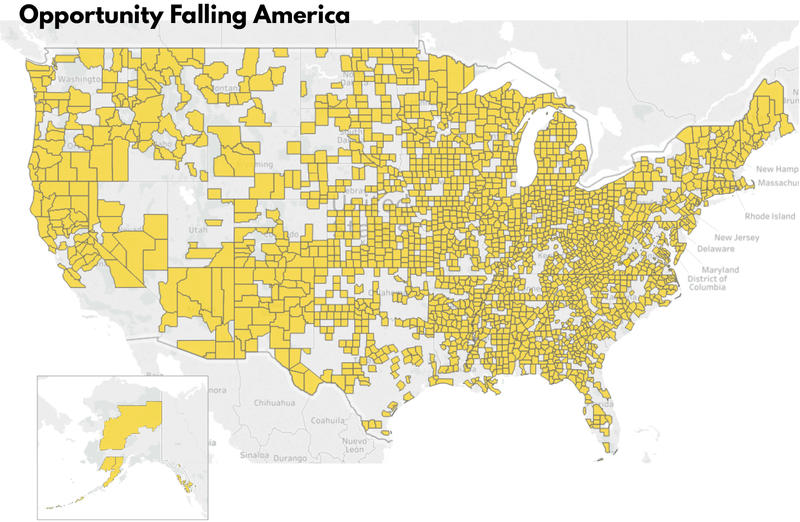 Opportunity-Falling America includes large urban counties like Oakland County, MI which lost 3,053 businesses, medium-sized exurban counties like Luzerne, PA which shed 608 businesses, and lightly populated rural counties like Toombs, GA which saw 95 businesses disappear. All 50 states have at least one county in Opportunity-Falling America (DC does not have a business-losing county). 179 of 222 counties in the “Blue Wall” states of Michigan, Wisconsin, and Pennsylvania are located there. There are wealthy and dynamic areas within Opportunity-Falling America. To be sure, all is not lost there. But each of these counties had a net loss of businesses ranging from 1 in Waldo County, Maine to 3,829 lost businesses in Cuyahoga County, Ohio. And over the same ten-year period, more than 1.2 million people fewer people were employed in the private sector in these counties. About 59 million people voted in the 2016 presidential race there and the outcome was not close. Donald Trump won the popular vote by 53.0% to 47.0%. His Electoral College victory would have been a landslide, taking 343 electoral votes to Clinton’s 195. To amass 343 electoral votes in Opportunity-Falling America, Colorado, Illinois, Nevada, Oregon, and Washington flipped from Clinton to Trump compared to the actual election.4 Michigan was the only state that went for Trump but flipped to Clinton in Opportunity-Falling America.5 This was mostly due to Wayne County, home of Detroit, which lost 2,778 businesses but still conferred a 260,000 margin of victory for her. 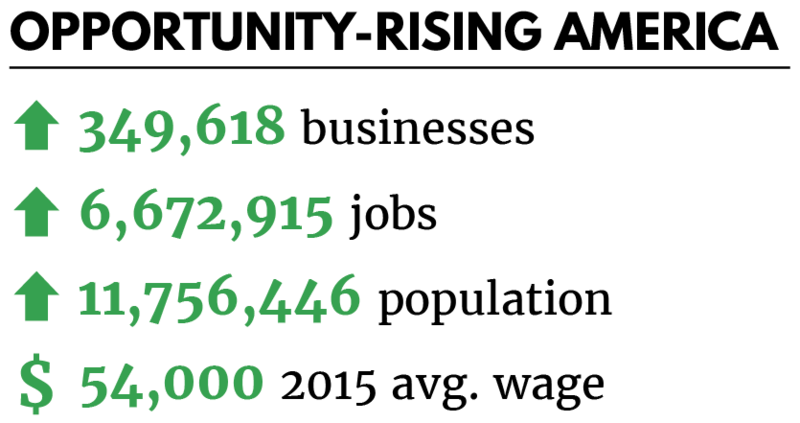 Opportunity-Rising America is made up of the 1,029 counties that gained a total of 349,618 businesses between 2005 and 2015. That is an 8.5% increase in the number of business establishments up and running compared to 2005. It is important to note that even within Opportunity-Rising America there are pockets where opportunity is scarce and poverty is grinding. Some of the wealthiest and most dynamic counties in America have some of the poorest and opportunity-barren places in America. Just as all is not lost in Opportunity-Falling America; all is not rosy in Opportunity-Rising America. As the population grew by 11,756,446 in these counties from 2010 to 2016, the number of people working in private sector employment increased by 6,672,915 from 2005 to 2015. Average private sector wages went from $41,243 to $54,000 in nominal dollars, a 30.9% increase. Opportunity-Rising America includes large urban metropolises like Los Angeles County which added 20,253 businesses, suburban areas like Loudon County, Virginia which gained 3,248 new businesses, and rural counties (often associated with an energy economy) like Dunn County, North Dakota which went from 86 to 190 businesses by 2015. Forty-seven states and DC had counties there.6 And over this ten-year period, the counties here added almost 6.7 million private sector jobs. Just over 69 million people cast their ballots for president there, and if these counties were the entire country, Hillary Clinton would have thrashed Donald Trump in the popular vote and edged him in the Electoral College. In Opportunity-Rising America, Clinton won the popular vote 54.6% to 45.4%. The last time a presidential candidate won a race by a greater percentage margin was Ronald Reagan over Walter Mondale in 1984. Clinton’s Electoral College victory was a more narrow 286 to 252. 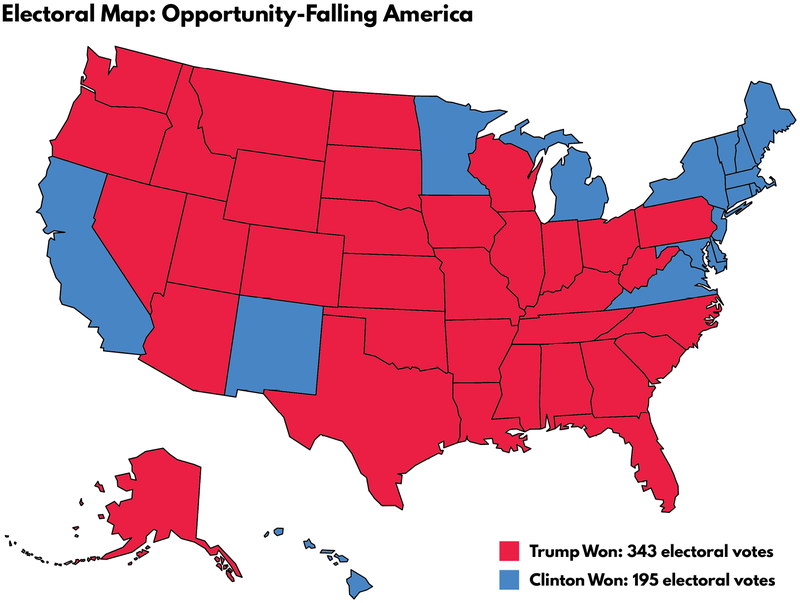 To get his 252 electoral votes, Delaware, Minnesota, and New Jersey flipped from Clinton to Trump in Opportunity-Rising America compared to the actual results. Perhaps there is nothing new in this split electorate. Maybe voters in these counties have habitually supported the Democrat or the Republican running for office. So we overlaid the 2004 county-by-county presidential vote over these two sets of counties. 2004 is significant because it is the year immediately prior to when we started measuring the growth or contraction of businesses county-by-county. What we found is that compared to 2004, the behavior of voters in these two parts of America changed dramatically. To begin with, there was practically no opportunity gap in 2004. George Bush beat John Kerry by 3.4-points in Opportunity-Falling America. He beat Kerry by 1.2-points in Opportunity-Rising America. In 2004, the spread between Opportunity-Falling and Opportunity-Rising America was a mere 2.2-points. In 2016, the spread in the Trump-Clinton race was a yawning 15.2-points. In fact, Hillary Clinton captured 10.2 million more votes in Opportunity-Rising America than she won in Opportunity-Falling America – 38.0 million to 27.8 million. John Kerry captured just 1.7 million more votes between the two Americas – 30.5 million to 28.8 million. Moreover, unlike 2016, the Electoral College outcome of the two Americas in 2004 would not have changed. Bush won in Opportunity-Rising America by 327 to 211 electoral votes. He won in Opportunity-Falling America by 314 to 224 electoral votes. 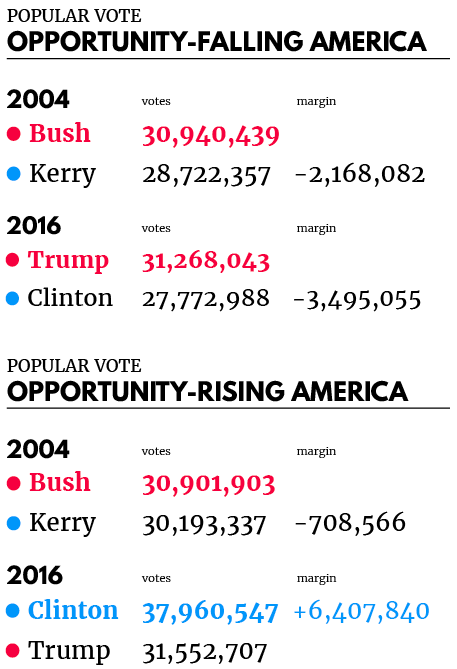 And strikingly, despite Kerry losing the general election by 2.9 million votes (as Clinton won hers by 2.9 million), he actually outperformed Clinton by more than 1.3 million votes in Opportunity-Falling America. On the other hand, Clinton swamped Kerry in Opportunity-Rising America, outperforming him by more than 7 million votes. The opportunity gap in the electorate appears to be a new phenomenon at least when the 2004 and 2016 elections are compared. As noted earlier, there wasn’t much of an opportunity gap in the economy in the prior ten years. The period from 1995 to 2005 was not only stronger economically, but far more of the country shared in the growth. Only 964 counties had a net loss of business between 1995 and 2005 compared to 2,109 counties that lost businesses between 2005 and 2015. And on average they lost fewer businesses, a 4.5% decline compared to 5.9%. The typical business loser county shed 41 businesses between 2005 and 2015 compared to just 16 businesses between 1995 and 2005. African-Americans are Democrats’ most reliable voting bloc, conferring margins of ten-to-one or better in recent presidential elections. They remained a reliable voting bloc in both Americas, but there is evidence that turnout lagged in Opportunity-Falling America in 2016. Using data from the progressive election data firm Catalist, we compared 2016 African-American turnout in the 25 counties8 that gained the most businesses in raw numbers between 2005 and 2015 against the 25 counties9 that lost the most businesses. According to Catalist data, which applies a model to estimate voters’ race in states where it is not included on voter registration rolls, 4,143,911 African-Americans were old enough to vote in the 25 biggest business winner counties in Opportunity-Rising America. 3,502,268 African-Americans were old enough to vote in the 25 biggest business loser counties comprising Opportunity-Falling America. African-American turnout in the 25 biggest winner counties was 57.44%. African-American turnout in the 25 counties representing the biggest business loser counties was 55.91%, a margin of 1.53-points, according to Catalist. Five of the 25 business loser counties had African-American turnout rates below 50%: Wayne County (MI) – 45.3%, Genesee County (MI) – 47.3%, Milwaukee County (WI) – 48.6%, Ingham County (MI) – 49.0%, and Providence County (RI) – 49.5%. None of the 25 business winner counties had African-American turnout rates less than 50%. To put this all in perspective, if African-American turnout in just the Michigan counties of Wayne, Ingham, and Genesee had been 1.53 points higher – the margin in African-American turnout between business winner and business loser counties – an estimated 12,852 additional African-Americans would have voted in 2016. An estimated 94% of African-Americans in Michigan supported Clinton in 2016, meaning this turnout boost – in just these three counties – could have netted Clinton 12,081 votes, or enough to win the state by 1,377 votes. In an analysis of 2016 turnout using a Catalist model that measures voters’ economic anxiety, the turnout rate for African-American voters with a great deal of economic anxiety was about 20-points lower than African-Americans with less economic anxiety. African-American turnout in Opportunity-Falling America may be lower for reasons having nothing to do with the economy. There are many factors leading to a person’s decision to vote or not. However, in an analysis of 2016 turnout using another Catalist model that measures voters’ economic anxiety, the turnout rate for African-American voters with a great deal of economic anxiety was about 20-points lower than African-Americans with less economic anxiety. It’s worth considering that voters in a region of declining opportunity may be less motivated to support a candidate who is not seen as a change agent, even if that candidate’s opponent is Donald Trump. We will explore this possibility in future research. Two-thirds of America’s counties shed businesses over a ten-year period and one-third gained them. In essence, the digital age has created two different economies spread out through America. In one economy, opportunity gathered; in the other it disbursed. As recently as twelve years ago, these two sets of counties voted almost identically. Now they are not only different economically, they are different politically. The polarization of opportunity has been a precursor to the polarization of politics. The antidote to the ugly populism seizing much of America may be to spread opportunity to more people and more places. We used county-by-county data from the Census Bureau to locate the number of business establishments, employees, total payroll and population in each county in America for the years 2005 and 2015. For 1995 we only looked at the number of business establishments. The definition of a business establishment is defined here by the Bureau of Labor Statistics. Using data from “Dave Leip’s Atlas of U.S. Presidential Elections,” we overlaid results from the 2004 and 2016 presidential elections over the county-by-county business establishment data. These two years represented the bookends of our business data. Election data on African-American turnout in the 25 counties that gained the most businesses and the 25 that lost the most businesses is based on analysis from the progressive election data firm Catalist. Election data on voter preference by racial demographic group was drawn from the Cooperative Congressional Election Survey’s 2016 survey. All of the calculations in this paper are based on the combination of these three datasets. The spreadsheet with the county-by-county data for 2005-2015 and the calculations can be found here, and for 1995 business data here. A few notes and quirks about the data: We were unable to obtain borough-by-borough election data from Alaska so that state is omitted from our analysis. There are a handful of tiny counties that have zero businesses or did not report. They are omitted from our analysis. Independent cities were treated as counties for this analysis, and not merged with nearby county namesakes (e.g. Baltimore City and Fairfax City). We made sure that in our analysis there was no double-counting of votes or businesses. In dividing counties between business winner and business losers, we placed the 31 counties that neither gained nor lost businesses in the winner category. Ian Hathaway and Robert Litan, “Declining Business Dynamism in the United States: A Look at States and Metros,” Brookings Institute, May 2014. Available at: https://www.brookings.edu/wp-content/uploads/2016/06/declining_business_dynamism_hathaway_litan.pdf. Civic Economics, “Small Business and the British Columbia Economy,” February 2013. Available at: http://nebula.wsimg.com/31f003d5633c543438ef0a5ca8e8289f?AccessKeyId=8E410A17553441C49302&disposition=0&alloworigin=1. Alaska is the only state for which we were unable to attain borough-by-borough vote data. In this analysis, we simply assumed that Alaska performed in Opportunity-Scarce and Opportunity-Laden America just as it had performed in the actual election. In all of our total vote tallies, Alaska votes are not included. 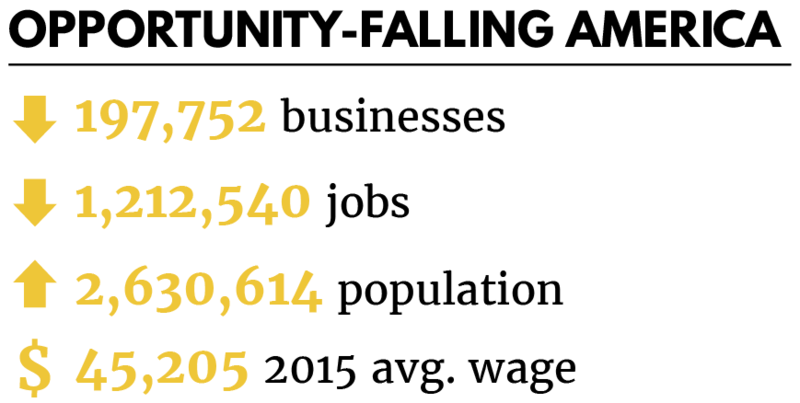 DC has no counties in Opportunity-Falling America. In such cases, we apportioned its electoral votes as they were in the actual election. Rhode Island, Connecticut, and New Hampshire had zero counties that gained businesses between 2005 and 2015. Because Connecticut, Rhode Island, and New Hampshire had no counties that gained businesses, their electoral votes were apportioned based on their full state results. Los Angeles County (CA), Kings County (NY), Harris County (TX), Miami-Dade County (FL), Travis County (TX), Queens County (NY), Collin County (TX), Maricopa County (AZ), Clark County (NV), San Diego County (CA), Orange County (CA), Tarrant County (TX), Fort Bend County (TX), King County (WA), San Francisco County (CA), Wake County (NC), Denton County (TX), Palm Beach County (FL), Bexar County (TX), Williamson County (TX), Mecklenburg County (NC), Riverside County (CA), Orange County (FL), Montgomery County (TX), and Loudoun County (VA). Cuyahoga County (OH), Oakland County (MI), Wayne County (MI), Hamilton County (OH), Bergen County (NJ), Richmond City (VA), Essex County (NJ), Milwaukee County (WI), Shelby County (TN), Fairfield County (CT), New Haven County (CT), Lucas County (OH), Providence County (RI), Montgomery County (OH), Camden County (NJ), Genesee County (MI), Jefferson County (AL), Marion County (IN), Union County (NJ), Morris County (NJ), Ingham County (MI), Stark County (OH), Hinds County (MS), Allegheny County (PA), and Summit County (OH).